Probably invented somewhere around 1890, the Metropole was the house cocktail of New York City’s Metropole Hotel. The Metropole stood near 42nd and Broadway—the heart of the city’s theater district, not a safe or savory neighborhood even in the 19th century. It was Times Square, before Times Square existed. Whatever failings the hotel and its neighborhood may have had, the cocktail named for the place should find welcome in any respectable bar. It is delicious, comfortable, and delightfully balanced. Stir all ingredients until very cold; strain into a chilled cocktail stem. Garnish with cherry (original) or lemon twist. As for the brandy itself, a mixing-grade cognac seems just the thing here. The Remy-Martin VSOP cognac is the Cold Glass house brandy, and makes a fine Metropole; I’m sure any number of other VSOP-grade cognacs would be good, as well. Noilly Prat’s vermouth seems to be made for this drink. 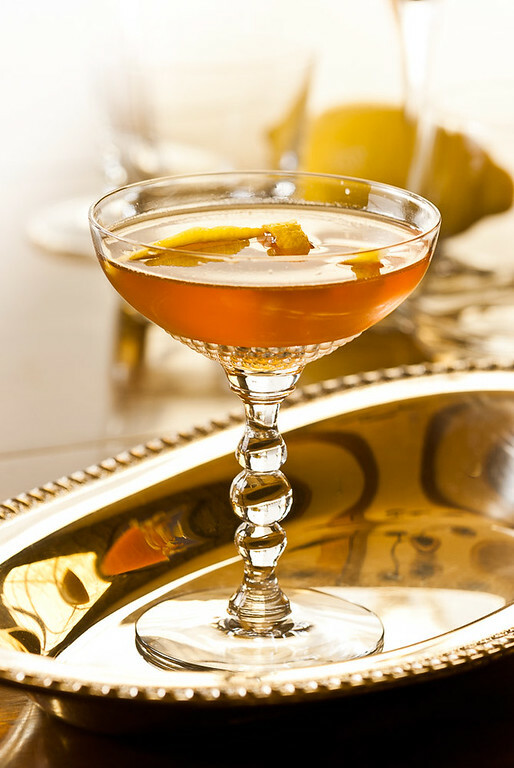 Its lush, herbal character blends perfectly with the cognac and the spices in the Peychaud’s. The little bit of sugar—about a barspoon—is barely needed, but it rounds out the flavors nicely. “The Metropole Cocktail” at cold-glass.com : All text and photos © 2011 Douglas M. Ford. All rights reserved. I think I need one of these RIGHT NOW! The name alone is worth trying this cocktail. Love it! I gotta get me some brandy, stat. Thanks for sharing, Doug. Your observations, insights, presentation, and introduction to new drinks is much appreciated. Is it weird to wonder whether there is a pumpkin or pumpkin-spice type of cocktail for the Thanksgiving holiday? Or would something like that just taste too awful? Never had anything like what I’m wondering about, but feel like if anyone would know, you would! I’ve seen recipes containing pumpkin, but the idea of squash in a cocktail is very off-putting to me, unsightly and grotesque, strictly off my list of interesting things. Pumpkin spice is another matter altogether, and a much more attractive proposition. Aromatic bitters often include the same spices as pumpkin pies, and the flavors of pumpkin and apple pie spices are often present in Italian sweet vermouths—Boissiere comes to mind. So perhaps the path I would take is to find cocktails that complement the pie, rather than emulate its flavors exactly. Something long on vermouth and bitters. A Saratoga, perhaps? Delightful cocktail. I made this tonight using martini rossi vermouth as it was the only vermouth in the house I am visiting but anxious to try again at home with my own selection of vermouth. Dolin is my house French vermouth but I have an unopened bottle of Noilly Pratt in the cabinet that I have been waiting for someone to suggest I crack open…Happy New Year! Thanks, and Happy new year to you, too. Glad you enjoyed the Metropole. This is a great cocktail. Just tried it with Armenian “Cognac” Vaspurakhan instead of French Cognac. You should give it a try. So many brandies, so little time… Thanks for the suggestion.